I don't bake cakes that often. Mainly because I feel like they're the ultimate 'special occasion' dessert, and I usually only bake them for family events like birthdays or anniversaries. [And one time my Italian cooking teacher paid me to bake him one so he could pass it off as his own at a faculty dinner party, but that's besides the point]. This was for no such occasion [though would have been very nice to be paid for it], but rather, a cake-off. So, of course, I had to enter. I didn't end up placing, but the it was a hugely fun time. And all of the cakes were scrumptious. Well worth the energy. 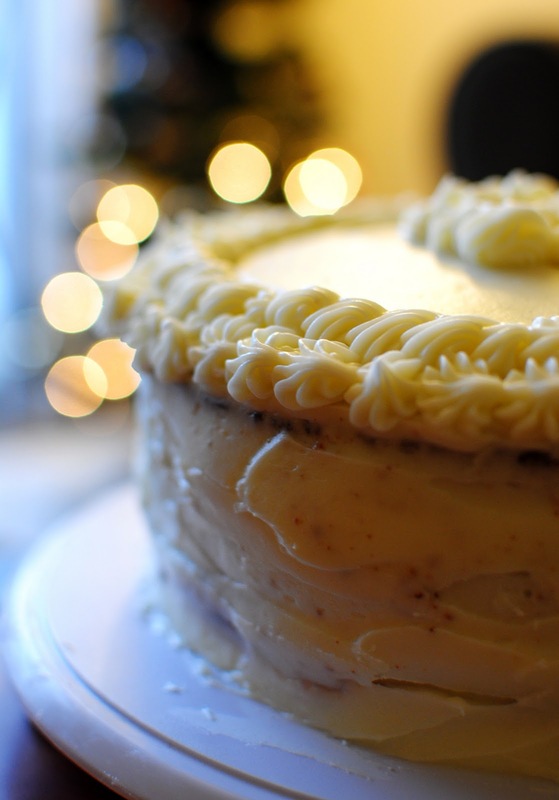 There are 3 main components to this cake: the 1-2-3-4 cake, lemon curd, and lemon cream cheese frosting. For the strawberry layer, I purchased strawberry preserves from Teeter earlier today [in a perfect world, it would be strawberry season right now and I would have slaved away at making my own, pectin-free strawberry preserves. but alas, I am lazy.] I'll give you the 1-2-3-4 cake and frosting recipe here, and I've written up the lemon curd recipe prior. Preheat oven to 350 degrees Fahrenheit. Grease and flour two 8-inch cake pans, or one 9-inch springform pan. Beat butter until creamy. Add in sugar and beat until light and fluffy, 6-8 minutes. Add in eggs, one at a time, and beat until fully incorporated. In a separate bowl, combine flour and baking powder. Alternately add flour and milk to the wet ingredients, beginning and ending with flour [meaning, add 3/4 cup flour, add 1/4 cup milk, add an additional 3/4 cups flour, 1/4 of the milk, etc., but begin and end with the flour]. Add vanilla last and mix until just incorporated. Spoon batter into the two 8-inch cake pans or the 9-inch springform pan. If using the two pans, bake for 30-40 minutes, or until a toothpick comes out clean when poked into the center of the cake. If using the 9-inch springform, bake for 65-75 minutes. If the top of the cake starts to burn, loosely cover it with aluminum foil and continue baking. Let cake cool for 20-30 minutes before removing from the pan. Let cool an additional 20-30 minutes before slicing [horizontally] into layers. Slice 8-inch cakes in half for 4 total layers, or 9-inch cake twice for 3 total layers. Meanwhile, prepare frosting. To make the frosting, beat cream cheese, butter, lemon juice, lemon zest, and vanilla until light and creamy. Slowly add confectioner's sugar. Add more confectioners sugar or lemon juice, depending on desired consistency and tangy-ness. Frosting can be refrigerated in an airtight container overnight. 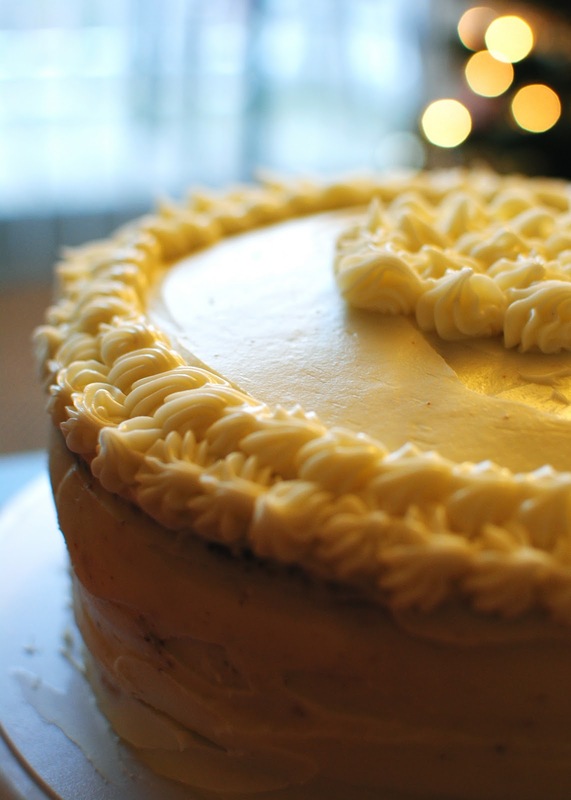 To assemble cake: make sure all cake layers are completely cooled before frosting. Place the bottom layer of the cake [usually I flip the 'top' of the cake and use it as the bottom layer, because it is the most misshapen and least flat, and sitting on the bottom will even it out]. 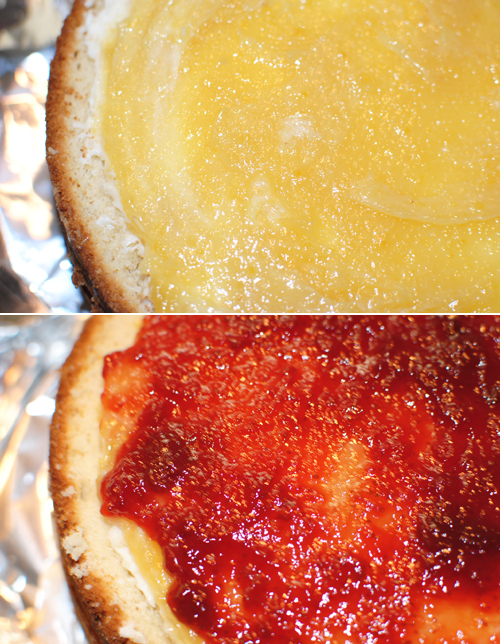 Frost with a generous amount of strawberry preserves, leaving a circumference about 1-centimeter wide around the edge of the cake [because all the layers will spread the filling out to the edges]. Gently spread a thin layer of the cream cheese frosting on top of the strawberries. 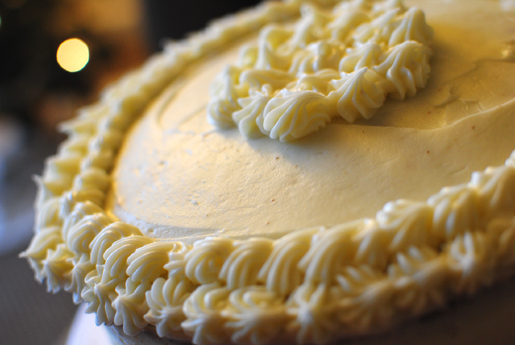 Spread a generous amount of lemon curd on top of the cream cheese frosting. Place the next layer on top. Continue frosting the cake layers the same way, until cake is fully layered. Frost the sides and top of the cake with the remaining cream cheese frosting. If desired, reserve 1 1/2 cups of frosting to pipe a border around the top and bottom of the cake. Refrigerate until serving, but make sure to serve within 2-3 hours. 1-2-3-4 cake is my go-to, basic cake recipe. And it should be in every baker's repertoire. I never really had a huge problem with boxed cake mixes for layer cakes, because they're fast, cheap, and generally taste okay. But after making a 1-2-3-4 cake for the first time, I have given up boxed cake mixes for good [well, except for in my adaptation of Paula Deen's gooey toffee butter cakes, but that recipe will come another time]. I sometimes use almond extract alongside the vanilla for a more sophisticated-tasting cake [because almond extract is divine with coconut frosting], but the vanilla is just perfect for any layer cake. Or just to eat plain. Heck, sometimes mom has me bake it so she can freeze half and slice the other half up into small pieces to have with tea in the morning. It's really that delicious. As for the lemon and strawberry combination? It's pretty classic, actually. Though, the first time I used it was in Nitya's 18th birthday cake a few years ago, with an angel food cake in place of the 1-2-3-4. It was so good, and one of her favorite cakes of all time. Though, now that I think about it, I'm sure a lemon-blueberry would be equally as delicious. Wish I could have snapped a shot of it sliced up, because the layers turned out perfectly. The cake itself was a little bit dry, but that's because I naively cut the layers last night and covered them in plastic wrap. Ideally I would have baked the cake the day of, but nevertheless, the filling helped moisten it some. In other news, I have one class day until exams start. It's going to be the longest day of my life. And then I'm going to spend my month off sleeping. I can't wait. OH.MY.GOD. IT'S ALMOST AS PRETTY AS YOU. It really was the best cake I have ever had! one else know such specific approximately my problem. I almost never create responses, but I browsed some of the comments here "lemon strawberry layer cake with lemon cream cheese frosting". I actually do have a couple of questions for you if you don't mind. Is it only me or do some of these remarks look like they are left by brain dead people? :-P And, if you are writing at other online social sites, I would like to keep up with you. Would you list of every one of your public pages like your linkedin profile, Facebook page or twitter feed?